Plant a gourmet mint collection. Don’t just plant peppermint when there are so many to choose from: apple, ginger, pineapple, chocolate, spearmint, banana, Persian, and strawberry mint round out this collection. Used as a part of a stylized Mediterranean garden, Italian-style urns keep the mints from taking over the rest of the herb garden. In addition to being staples in the kitchen, many of the wonderful herbs that grow well in containers can be used to make tea and cocktails. If you’ve never tried sage bergamot or rosemary lemon tea, you are in for a real treat. Herbs also make delicious simple syrups that can be added to carbonated water or used to infuse alcohol for fun cocktails. 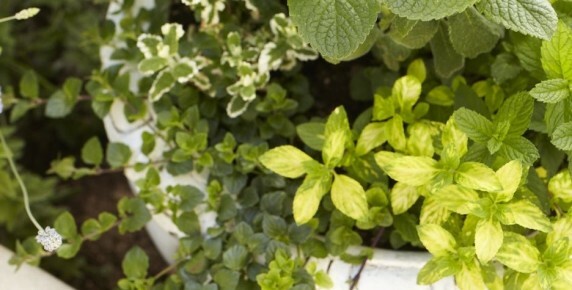 Dedicate a single container as a “tea garden” or “cocktail garden” and plant it with all kinds of herbs, including chamomile, lemon verbena, and mint. There’s no need to keep all your tea and cocktail herbs together, though. Because so many favorite herbs are also colorful, flowering perennials, you can dot them in various containers throughout the garden. Whichever herbs you choose, they are easy to put to use. You can dry herbs and make your own tea bags out of muslin, or simply grab a few handfuls of fresh herbs to put in your teapot. Note that tea made from fresh herbs takes longer to steep than tea made from dried herbs. Pour boiling water over the fresh herbs and let them steep for fifteen to twenty minutes. Culinary sweet bay, oregano, thyme, mint, and rosemary are all great ingredients for tea and cocktails.